The Motorola AP 8132 access point's unique modular architecture increases your readiness to meet your evolving needs, making it the ideal future-ready platform for deploying applications at the edge. Its innovative design accepts up to two module attachments to the base, offering you the flexibility to add new capabilities, transform the user experience and enhance the productivity of your team. And because youâ€™re leveraging your wireless infrastructure, application deployment costs are significantly reduced since you no longer have to run separate network and power cabling. The AP 8132 is a 3-spatial stream access point with two radios, delivering data rates of up to 450 Mbps per radio over WING 5 architecture. Whether youâ€™re using voice, data, or bandwidth-intensive applications like HD video, you can be confident your network can handle the traffic and provide the optimum user experience. AP-8132-66040-WR	 AP 8132, Ap8132 Dual Radio 3X3: 3 Access Access Point 802.11. 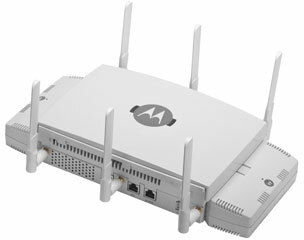 AP-8132-66040-US MOTOROLA AP-8132 DUAL RADIO ACCESS POINT 3X3: 3 REQUIRES ANTENNA AND POWER SUPPLY AP-8132. WORDLWIDE VERSION. The Motorola AP-8132-66040-WR is also known as MOT-AP813266040WR	or AP813266040WR	.